Check Out New Crawler Toolbar Features! 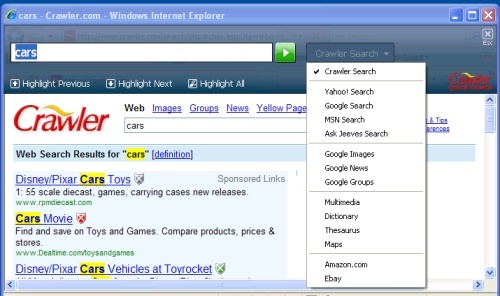 Enhanced Search - New Crawler Toolbar has been revamped to make your Web searches even more productive and let's you quickly find what you're looking for. Quick Search uses your favorite search engine to quickly find your terms on the Internet and also finds and highlights your search terms on a website. Look for... feature helps you find businesses, people, maps, images, news and other useful information with a single click. Classic search box lets you search the Web using your favorite search engine or get search results from multiple search engines at once. Easily add services thanks to the new Services menu. You'll be able to manage your Crawler Toolbar services so you can conveniently install and uninstall them with a single click, enable and disable services and show or hide buttons on your Crawler Toolbar. Multi-language support - Crawler Toolbar 5.0 is currently available in English, Spanish and Portuguese languages, and will soon be available in more languages. Would you like to help us translate Crawler Toolbar into your own language? Contact us at . Download and install Crawler Toolbar 5.0 on your computer today and start enjoying all its cool features!